LARGE STORAGE FOOD KEEPER: 5.2L(175oz. 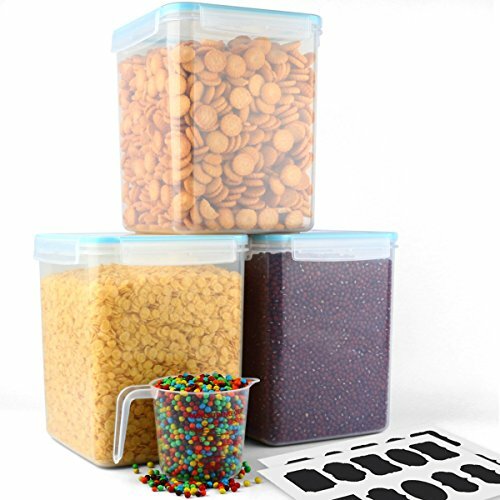 )storage containers are good to keep cereal ,snack,flour,nuts,sugar,coffee,tea,dry pet food or anything you need to store. FOOD GRADE PLASTIC&AIRTIGHT LID: MCIRCO flour containers are made of high-quality food grade plastic,BPA-Free,non-toxic and safe from any harmful materials.Four Side-locking airtight lids seal these containers firmly and protect your food from pets,as well as moisture and air oxidization. EASY TO CLEAN:Our containers are dishwasher safe and easy to clean. You can say goodbye to painful scrubbing.In the meantime, we are also considerate enough to send you 20 pcs chalkboard lables and a measuring cup.